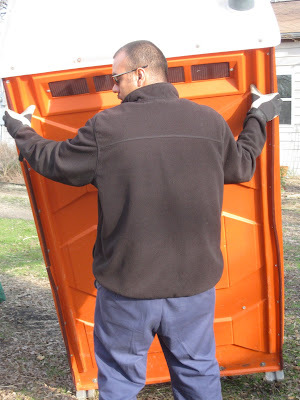 The fun started early as Ivan from United Services pulled up in the drive way with our new Port-a-Potty! I'm telling you, this is a big moment for the farm. We are becoming such a gathering place, so regularly, that it now makes sense to provide sanitary services all the time. No more busing people down the street when the septic system is strained! We can enjoy our monthly spin-ins, farm tours and work days without pulling off our boots and tippy-toeing through the house. 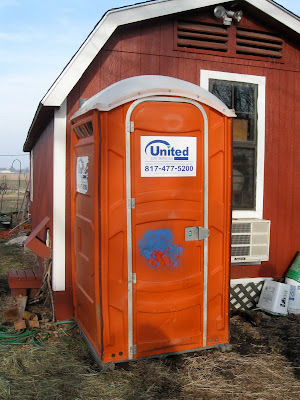 This little "comfort station" will be clean and available, but hopefully not terribly noticeable in our landscape. There's a motion sensor light here on the back of the barn, so even at night, it will be easily accessible. Today, Phineas got to play outside with the flock and with Judah for the first time. Unfortunately, we've found Judah's tiny flaw: he likes to chase Phin. Maybe he just hasn't figured out that Phin is "one of us," and with time he'll settle down. I hope so. We just can't have the guard dog harassing the flock. You're gorgeous, Judah, but you've got to toe the line and stick to your job. I remind myself that he's really still young, and that he has performed beautifully aside from this new situation. More new spinners continue to make lovely yarn in the Little Red Barn. See what Karen made? Great job! And Gail is really doing so well with her spindle. Besides spinning, Gail is accomplished at many other art forms. I hope to get some pictures of the lovely things she makes - dolls, metal sculptures, and more. I got the word today that Danny, our shearer, has us on the calendar for next Friday morning, first thing! I know that's not terribly convenient for everyone on a weekday morning, but I'm kind of dependent on Danny's schedule. If you're available to help, I'd love some extra hands. We'll pen the sheep, set up an area for Danny to actually do the shearing, and move the fleece out of the way quickly after it's off the sheep. I can have the skirting table set up and we can do the preliminary skirting before we bag up the fleeces. The following week, we'll begin the detailed cleaning of the fleeces prior to processing. Beginning at 10 AM I'm going to start tearing out the old fence that has been replaced with new fencing down by the creek. Come on by with your boots, gloves and wire cutters if you'd like to join in with us! There's the subconscious working - I just noticed that I called Judah "Judas" in the heading. Let's hope he isn't really a back-stabber. I was just coming out to comment on your slip and I see you already noticed! How funny. Poor Judah. ;-) After all, it's his job to chase off intruders. How's he to know this new guy had an invitation? He'll figure it out. Yes Phin will fit in next week when everyone else looks like him. Claire and I will be there for shearing. This is what I've been looking forward to all along in my future sheep farmer lessons! Can't wait! Hi Cindy, and especially Karen and Gail! We had our meeting today here in Somerset, UK. Keep looking out for pictures on my blog. Anita brought her spinning wheel today. I hadn't realised what a soothing noise it would make! Hope you're enjoying your group as much as we are all enjoying ours!